Tags: Churidar Pajama, Dark Purple, Pishwas, Shocking pink, Walima & Second Day. Dark purple Anarkali pishwas having pure banarsi center panel. 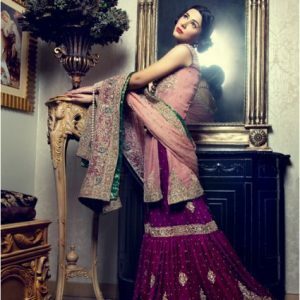 Side panels is made of embroidered chiffon.Long embroidered neckline made of silver kora, dabka, stone and tilla work on center panel.Silver lace is implemented on hemline. Finished with banarsi piping. Concealed with back / side zip closer. Shocking pink banarsi chiffon dupatta. Dupatta is finished with banarsi piping on four sides. Dark purple pure rawsilk churidar pajama.Fully elastic / fixed belt and side zip options.